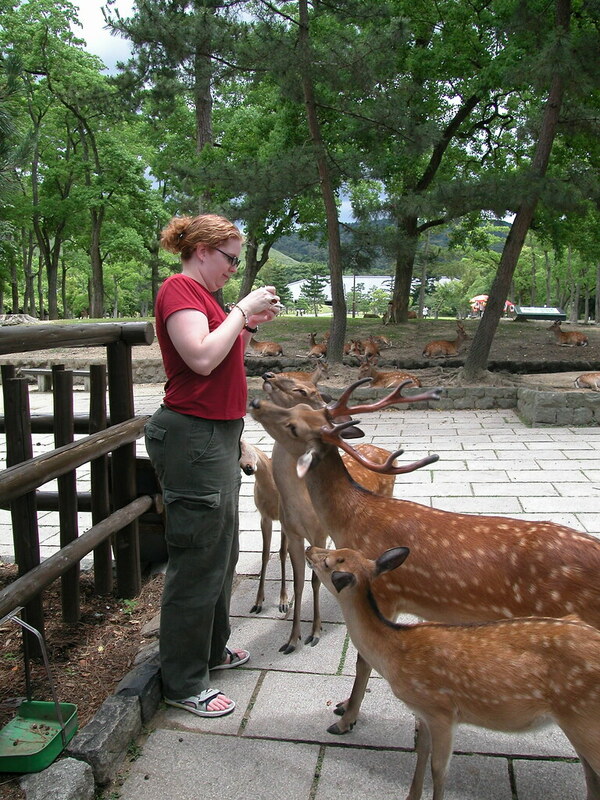 The sika deer in Nara, Japan, have it made: they are treated like the sacred cows of India, allowed to wander everywhere and eat pretty much whatever they want. James Dorsey writes in the LA Times that the deer have learned to bow to visitors. Vendors and vending machines sell “deer courtesy crackers” (鹿煎餅 Shika–senbei) and outdoor restaurants provide diners with the biscuits so they can get the deer to leave them alone. Japanese writer Noboru Ogata says that the sitka deer (Cervus nippon) have been around the Kasuga Shrine (near Osaka) since the 12th Century and were considered a good omen from the gods. Since they were literally sacred gift, people were put to death for killing them. Now they are officially a national treasure. About 1200 roam the city park. They have an annual Shika Tsuno Kiri festival to trim the deer’s horns.